The MW Series Triplex Plunger Pump is available in 6 flows. 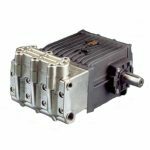 The incorporated gearbox is available in 3 ratios, 1500, 1800 and 2200 rpm. It has double pressure packings, vertically fitted suction/delivery valves, splash lubrication and includes optimal drain/priming valve kit. Includes external gearbox posionable on left or right hand side of pump. Please specify RPM and gear box position when ordering.